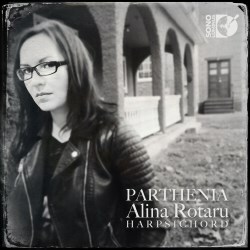 During 2016 there have been a few recordings that have referred to, and even used, excerpts from Parthenia, the important early keyboard manuscript. At the end of the year (2016) it is very gratifying to have a disc which presents the whole work, especially one that is played as well as this. Parthenia was the first collection of printed keyboard music in England, and for that matter, Europe. It dated from around 1612. It is a collection of twenty-one pieces composed by the three eminent English composers of the day, Byrd, Bull and Gibbons. The collection was conceived by the engraver William Hole as a wedding present for Princess Elizabeth Stuart, the eldest daughter of King James VI and Frederick V, Elector Palatine of the Rhine. There is a great deal of symbolism behind the manuscript, which John Moraitis, in his excellent booklet essay explains. Firstly, 'Parthenia' comes from the Greek 'parthenos' meaning maiden or virgin. Whilst it can refer to the full title of the work Parthenia, or the Maydenhead of the first Musicke that was ever printed for the Virginalls, it also refers to Elizabeth Stuart, the virgin bride who was named in honour of Queen Elizabeth I, the “Virgin Queen”, and who was expected to play these pieces to entertain her new husband. The word Virginalls comes from the same Greek root as the Latin virga meaning stick or wand, and although an instrument in its own right, the term came to include any that mechanically plucks strings including the muselaar and harpsichord. Lastly there's the prominence of the letters ‘E’ and ‘F’, the initials of the intended recipients, in both the introductory text to the edition and the musical pieces themselves. In Gibbons’ The Queen’s Command they form the first two notes. The music itself draws on many musical styles that Elizabeth Stuart would have known. She was an accomplished keyboard player, which is evident from the pieces. We should note the inclusion of items by John Bull, a nod to the fact that he had been the Princess's teacher. They include some rather complex works based upon the popular dance styles of the day as well as preludes and fantazias. Indeed the collection unusually ends with Gibbons’ Preludium in G, although this is seen as further symbolising the start of the couple's married life together. The pieces included here can all be found on other discs but it is good to have a CD that brings them all together, especially since my other disc of Parthenia, that by Catalina Vicens on Carpe Diem (CD-16298) is in my opinion, somewhat spoilt by the inclusion of viols. Alina Rotaru plays extremely well and I was impressed with her touch and sensibility throughout but especially in her Byrd interpretations. The harpsichord itself is a modern copy of a 1738 single manual German instrument which sounds a little too big for the music — I turned the volume down a little — but has a beautiful tone, making this a really fine recording.